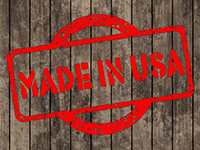 By now, anyone who is even a casual reader of our blog should know about the Federal Trade Commission’s (FTC) “Made in USA” requirements. As we have explained elsewhere, the FTC requires that a company’s products be “all or virtually all” manufactured in the United States (as well as “finally processed” domestically) for the company to make a “Made in USA” claim. The four closing letters from this month put at 15 the number of “Made in USA” letters the FTC has issued this year. The Commission issued 29 of these letters last year and 28 letters in 2015. The letters themselves are not surprising and likely involve inadvertent or unknowing violations of Guidelines that we have frequently labeled “counterintuitive.” But the letters also continue a trend of the Commission essentially sending out what amounts to warning letters rather than taking enforcement actions. Coupled with the FTC’s recent spate of educational letters on the undisclosed use of social influencers, and the Commission’s not-quite-so-recent letters to companies that it felt could do a better job with disclosures, the “Made in USA” letters make one wonder whether the Commission is embracing more of the “one free bite” philosophy, at least when it comes to situations that fall well short of out-and-out consumer fraud. For advertisers who try in good faith to comply with the requirements of Section 5, this would be welcome news indeed. So what did these companies have to promise in order to avoid an actual law enforcement action? In this age of multifaceted marketing, the list is rather long and varied. It includes relabeling products still in inventory, phasing out “Made in USA” decals, stickering printed materials, updating all marketing materials, sending notices to dealers about the discontinued claim, and deleting or editing social media posts as well as making efforts to identify and remedy any improper claims that third-party marketers make. At least one company also committed to “implementing a procedure to review regular reports for items whose production has shifted from U.S. to non-U.S. manufacturers” and to “increasing legal review of the Company’s U.S.-origin claims.” This last item is probably a good idea for all.